Undoubtedly, furniture is basic in any interior, lamps follow it and finally, there are fabrics such as curtains. They can be smooth, light and translucent and they do more than just decorate the room. However, they are not a must and many people can do without them. Curtains are not ideal for allergy sufferers, too, as they constitute a kind of filter, which catches almost all dust and pollen particles floating in the air. Yet there are many people, who swear on curtains, and the investment in them is not so staggering, so you can afford to get new ones from time to time. Forget the garish curtains reaching barely to the half of the window and trying to look like embroidered, or even lace ones. In a modern interior, additional elegance can be achieved by smooth and simply flowing curtains reaching to the ground (you can afford them in summer, and in the heating season you replace them with curtains reaching to the window sills only). Patterns are not particularly striking, as well, and stylized nature motifs or simple geometric shapes are the best choice. Try to get away from stereotypes and purchase coloured curtains. They not only revive the interior in an interesting way, you can also appreciate their practical side, as coloured curtains do not show visible signs of getting yellow or gray. However, if your taste is more conservative, we can recommend you ivory or creamy curtains; these delicate colours transmit pleasant and soft light into the room. Each colour of curtains affects the space in its own way. In the kitchen, you can place bright yellow curtains to brighten the room, and in the bedroom, blue is suitable as it has calming effect. Curtains are not used only for decorating the windows and shading the rooms. If you install tracks on the ceiling according to a planned scheme, you can transform the interior gracefully by simply shifting the curtains, e.g. to separate the place for sleeping. These “light partitions” do not burden the space and they are practically invisible, when folded. Despite their long history, they are truly modern and sophisticated alternative of window shielding. The large flat surface brings out interesting patterns and by choosing the material, you can set the amount of shading, from the simple transparent ones to completely blackout ones. This type of window shading dominates the interior. 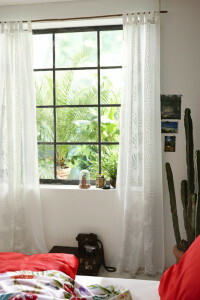 Choose the ideal width of bands according to the dimensions of the window or the wall, so that after full stretching, at least two-thirds of the window remains uncovered. The parts move in their tracks, each one in its own groove. On the underside of the belt, there is framework or a weight, which ensures perfect stretching of the material. Are your curtains gray because of dust or yellowed by cigarette smoke? They can be white again. Soak them in water with crystal soda or common salt (10 l: 500 g) at least for one hour, preferably overnight. Rinse the curtains well with clean water and repeat it until the water is completely clear. Add some baking soda to the washing detergent. Add a teaspoon of blue ink into the last rinsing bath which will brighten blue curtains up. Do not wring the curtains, just let them drain. Hang the curtains still wet, the folds will sag and the curtains will remain neatly straight.